The Chart of Accounts (CoA) will be the basis of your organization's accounting. Here you'll have all the accounts you'll need to keep track of the transactions taking place in your organization. It will make sure they're organized logically in the General Ledger so that you can always access these accounts. The CoA is structured around two different types of GL accounts, called Header and Detail accounts. Detail accounts will be the ones that will store the transactions' balances. Whereas Header accounts are used to group Detail accounts under a same category, and have no transactions associated to them. For instance, Current Assets could be a Header account and Bank Account would be one of its detail accounts. The GL Code of the accounts will determine which Detail accounts are nested under which Header accounts, and the overall position of a GL account in the CoA. - The first digit shows the initial hierarchy and position, the second the second level of hierarchy and so on. - Header Accounts sum up every other GL Account starting with their same hierarchy level. To add a new account to your CoA, just go to Accounting > click on Chart of Accounts > Add a New Account. In Account Name enter the name you want to have associated to the new account. The name should be short but clear so that other users know exactly which account it refers to. GL Code, the General Ledger Code number for the account. Determines the position of the Account in the CoA. In Type you need to choose whether the new account is an Asset, Liability, Income, Expense or Equity. Usage is whether this will be a Header or a Detail Account in your financial reports. In Description you can add any additional information you want to have associated to the new account. After you've entered the information above, click Create and the new account will be added to your CoA. 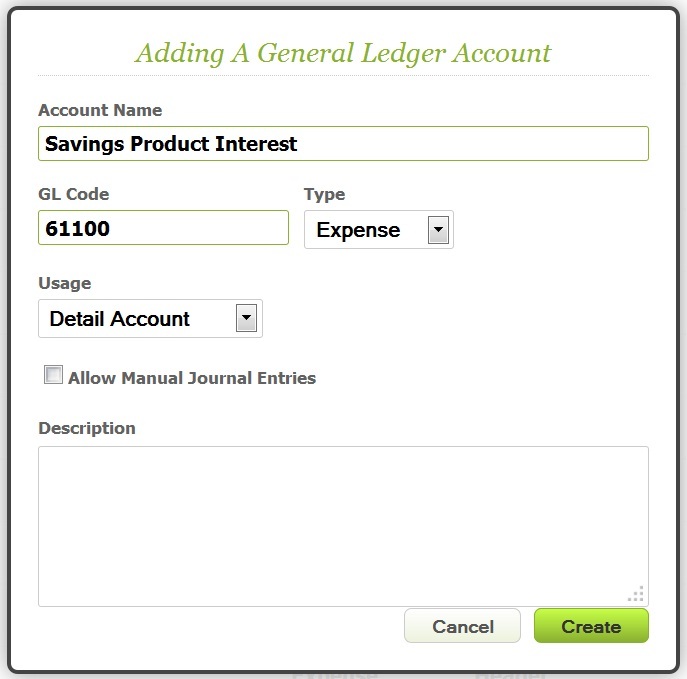 You can allow the manual journal entries for the account you created just clicking on the option "Allow Manual Journal Entries"
You can edit an existing account at any point. You can change the name, description and code of the GL accounts. To do so, click on the icon next to the account you want to edit > make the changes > Save. The changes will be reflected in the transactions which occurred before and after editing the account. You cannot change the accounts' Usage. So, you won't be able to turn a Header account into a Detail account or vice-versa. You can only delete accounts that never had any transactions logged against it.